Jason Lynn leads Eunan McGlinchey at Bishopscourt. Jason Lynn won the David Wood Memorial Trophy for the first time at Bishopscourt in Co Down at the weekend. 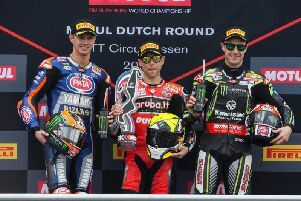 The Supersport class took top billing at the meeting, with the destination of the silverware decided over four races during the two-day meeting. Jason Lynn receives the David Wood Memorial Trophy from Lee Wood at Bishopscourt on Sunday. Lynn, riding the Walter Bell Suzuki, finished fifth in the damp in the first race on Saturday, which was won by Supersport Cup rider Kia McGreevy (McLaughlin Honda) from his brother Korie (Century Racing by IMR Triumph). Only 0.2 seconds separated the pair in a thrilling race, with Christian Elkin sealing the final rostrum spot ahead of Cup contender Mark Abraham. On a dry and bright day on Sunday, Korie McGreevy made a flying start in the second race, stretching clear to win by over five seconds from Supersport Cup rider Eunan McGlinchey, with Aaron Clifford on the Kingsbury Packaging Kawasaki in third. Lynn finished fourth ahead of Ross Patterson on the second of the KP Racing Kawasaki machines, with Saturday’s winner Kia McGreevy completing the top six. Meath's Cody Nally was fortunate to escape injury following a big crash on his Kawasaki on Sunday. Last year’s Irish Supersport champion Lynn staked his claim for the overall trophy victory as he claimed the spoils in race three, taking the chequered flag by two seconds from young prospect McGlinchey, who narrowly held off Elkin (Bob Wylie Kawasaki) by 0.2 seconds for the runner-up spot. Thomas O’Grady slotted into fourth ahead of Aaron Armstrong on the Hunky Dory Triumph, with Kia McGreevy in sixth. Lynn had to settle for the runner-up sport in the fourth and final race as he finished 1.1 seconds behind last year’s trophy winner Aaron Clifford, but his consistency was enough to secure the David Wood Memorial Trophy overall. Armstrong was third followed by McGlinchey, O’Grady and Elkin, with Korie and Kia McGreevy finalising the first eight. Lynn also leads the Irish Supersport Championship by 39 points from Ross Patterson, with Korie McGreevy in third, a further 23 points in arrears. Meanwhile, Lisburn’s Carl Phillips and Cody Nally from Co Meath both chalked up double wins in the Irish Superbike races. Nally opened his account in the wet on Saturday, securing victory by 4.5 seconds from Ryan Gibson, with Phillips in third on the MD Racing Suzuki. Luke Johnston, Adam McLean and Charles Stuart were the top six. On Sunday, Nally sealed a brace on his Kawasaki as he won race two by two seconds from Phillips, with Gibson in third. Johnston on his BMW and Mark Glasgow (Kawasaki) were fifth and sixth respectively. Phillips got off the mark in race three as he opened a gap of more than four seconds over Gerard Kinghan (Kawasaki), who was 4.5 seconds ahead of Charles Stuart in third on his Yamaha R1. In the final race, Phillips made it a double on the Suzuki Superstock machine, crossing the line with 1.1 seconds in hand over Stuart, who was closely followed by Kinghan in third. Nally was fortunate to escape injury after a big spill, thwarting his chances of adding to his tally. In the Production Twins races, Jonny Singleton clinched a treble, with Darryl Sharkey also winning three times in the Pre Injection class. Simon Reid and Marty Lennon were double winners in the Supertwins races, while Carl Phillips notched a hat-trick in the Lightweight Supersport class on a Yamaha 400 to earn the ‘Man of the Meeting’ Award following his Superbike double.